Season 2 of the contest that opened end of May and ends on 13th August. The contest gives graduate and post-graduate students the opportunity to showcase their ideas for changing the retail, public sector and finance verticals through technology inventions in mobility, social and business analytics space. The Yahoo! India Special section brings together articles, jury profiles, photos from tech campus activations and entries from last year’s contest. The Innovation Quiz has a fun twist where the answer is given out and participants need to choose the right question in the shortest possible time. Yahoo! India has been promoting the contest through house inventory on email login and home page, especially on weekends. 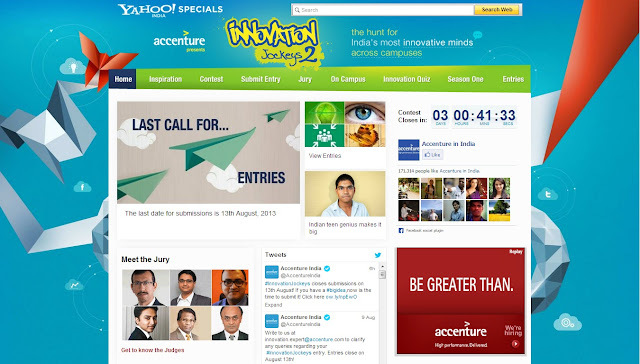 The microsite creative isn't the best that we have seen on Yahoo India but the interface does its job. Next year, if they are working on a reboot, hopefully more attention will be given to the design.